Go green with Radio Powr Savr. Wasted lighting can account for a majority of a building’s total energy usage. And with many building spaces remaining unoccupied between 40% and 70% of the day, lights left on are a real energy drain. Lutron wireless occupancy/vacancy sensors automate the switching and dimming of those lights, saving energy and money. It’s also convenient. You won’t have to worry about turning lights on or off anymore. Lutron occupancy/vacancy sensors automatically do the job for you every time you enter or exit a restroom, classroom, conference room, hallway - even your own office. Going wireless eliminates the need for costly new wiring. Radio Powr Savr sensors by Lutron install in as little as 15 minutes and communicate with compatible Lutron dimmers, switches and light control systems using reliable Clear Connect RF Technology, which ensures smooth, consistent performance. Lutron wireless sensors reduce installation time by over 70%* over wired options. Watch the video to learn how. This product uses Clear Connect technology. 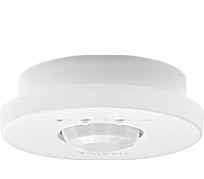 The new version of the ceiling-mount wireless sensor possesses a smaller form factor and the ability to be recess mounted (mounting bracket sold separately). The sensor diameter measures just 3.57’’, a reduction of nearly a 0.5” from the original version. The updated aesthetic assists in minimizing the visual impact of the sensor.